Blogging is a great way for a business to “connect” with customers. This is pretty much a universal truth and applies to all businesses, but it is especially true for online businesses such as an Etsy Shop. The simple fact is that online businesses have pretty much zero opportunity to make an in-person connection so any way to make an online connection becomes that much more important. As time passes and blogging becomes more mainstream, entrepreneurs from all over the business world are acknowledging the value of blogging for business but many miss the boat when it comes to the first orders of business. 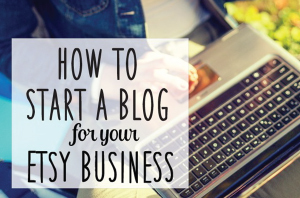 The first thing you should do with your blog is to set it up to provide value and make a connection. These two things are really one and the same. The best way for the blog to provide value to you as the business owner is to make a connection with your customer. The best way to make a connection with your customer is to provide value to them. It works both ways. This is really pretty simple. You don’t have to think up anything original or earth-shattering. You just have to put yourself in your customer’s shoes for a minute. You know who they are based on what you sell! Certain types of people buy certain types of things, right? Even if your product is totally universal in appeal, it must address a particular need, the presence of which tells you something about your customer and where they are (mentally, emotionally) when they visit your site. Knowing a little bit about the customer brings to mind certain needs they might have, right? How about some questions they could be asking? How about a fear they might be dealing with? Maybe a dream or a hope they might likely be thinking about? If you sell organic, locally grown coffee, for example, you might imagine that your customer is environmentally minded and health conscious, so any blog content about those subjects might be of use to them. You might further surmise that they are afraid of chemicals placed in mass-produced coffee, so you could share some information that educates them on this subject. You could also safely assume that they want to know more about where your particular product is grown, how it’s harvested, and what the manufacturing process looks like. All of these offer you an opportunity to provide value and thereby create a connection. Every product or service, no matter how simple, has these types of “trigger points” you can blog about. You are an expert in what you sell. Don’t you argue with me. You are an expert and that’s the end of it. Know it. Own it. Be it. 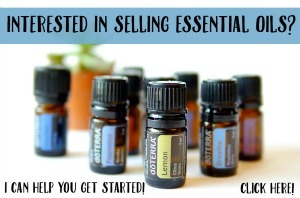 Who wants to buy anything from someone who knows diddly-squat about their product? Nobody! Don’t you get frustrated when you’re visiting a store and you ask about a product only to stand there fuming while the clearly product ignorant “salesperson” grabs the box and starts reading the same thing you just read? Grrrr. If you consider yourself ready to sell something then you must be at some level of expertise above the average person. It really doesn’t matter how simple and/or commonplace your product is. I’ve made lots of hot-dogs in my day, but I still readily admit that the lady who owns the hot-dog cart in the park knows more about the vast assortment of franks and dogs than I do. If she says hot dog A is better than hot dog B, I’m going to believe her. Your “about” page – talk about your experience and history in your niche. Why did you get into it? Why do you love it? What fascinating part of what you do just “hooked” you and made you know you wanted to make a business of it? Your promoted content – Most successful blogs have a number of things in common. One of these is that there is always “featured content”. This content is promoted on the home page via a large image, in the sidebars via links and/or images that persist on all pages of the site, and sometimes even in the footer too. Promote your best content! Content that shows your passion and knowledge for your subject while also providing value for the reader. By sharing your expertise on your blog and making sure your readers can find it, you’re doing yourself a great service. You’re helping your business make sales. Isn’t that the goal? I claim no knowledge of the true meaning behind the term “ten ways to Sunday” so if you know what that means, please share. All I know is that it means “a lot”. Provide lots of ways for your customers to find your blog and your blog readers to find your shop. You can’t (last time I checked) link directly from your Etsy shop but you can give the URL and tell people what they’ll find if they visit your blog. You can link to your blog from your social media sites and you can link to your social media from your blog. You of course should link to your shop from your blog, preferably with a very clear menu tab labeled “Shop” or “Etsy Shop”. The point is that you want people who are at any of your “outposts” online to be able to easily find your shop and your blog. So link where you can and write out the link where you can’t post a hyperlink. The main point is to create lots of easy to find connections between your shop, blog, and social media. Success in business is the same for everyone. Small steps add-up over time to equal real progress. The more you do these things, the more progress you’ll see. The more effort you put into your blog, the better it will be. The quantity of your content is important, but quality is even more important. 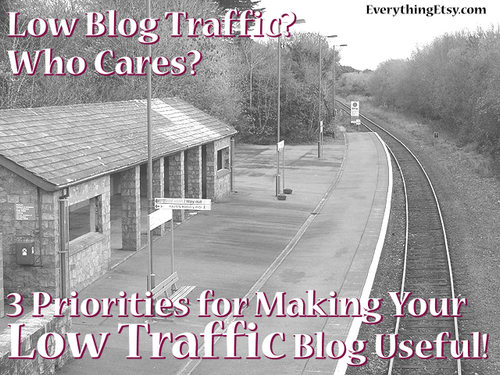 If you pay attention to these three priorities, even a low-traffic blog that only gets 15 or 20 visitors a day (or less) can be valuable to your business. It’s a matter of who those visitors are and whether or not you make a connection with them while you have the chance. Remember who you’re trying to connect with… your customers. Discussion? – When we talk about blogging it always brings up a few questions. Please feel welcomed to ask any blogging questions (or provide any blogging tips) you have in the comments! you always provide very useful tips and suggestions and I wanted to say thanks. I appreciate coming to your blog and learning something everytime I come to visit. I have my blog set up to share to Google + and was wondering, since my posts are created in a way that I can easily add further insight, when I have the thought- what is the generally accepted timeframe for shareing something that has already been shared… (same post with added feedback and thoughts)??? any thoughts would be welcome! thanks! Hi Jenn! Thanks for your comment. Great tip about sharing on G+. I always try to share each of our posts on various social sites when we first publish, but as you mention in your question, that’s not always the last time I share it. For new content that may have gotten more interesting because of the comments or something we’ve added, I’ll usually wait at least a few days before sharing it again on the same site (Facebook, for example) and even that would only be if I have shared quite a bit more in between (I would never want our page to have the same link shared closely together on the “timeline”). I know lots and lots of bloggers who regularly share older content on their social profiles. As long as you don’t wear out your audience, giving them useful links is helpful and chances are you’ll get a whole different segment of your followers each time you share. This is me! This is me!! great information, as always!! Thanks so much, Kim! great info even for the ones who have been around too– thanks for the reminder! Thanks Kim! This is a terrific post. I suffer from the “what do I blog about”! We want to keep our blog about “Lady Like” things and not everyday things. I really really like your post. Going to re-read and try to practice it. Very interesting blog! I do not have a blog, but I am definitely considering getting one! Maybe it will help my business take off!